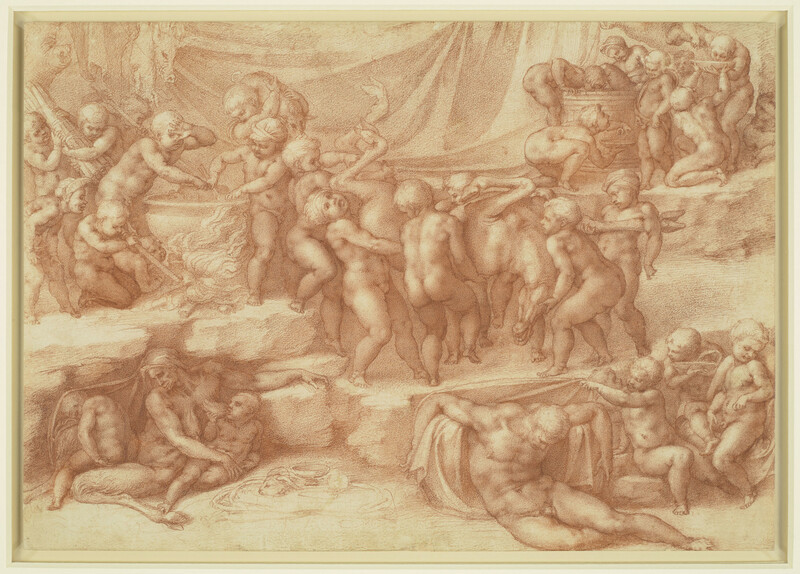 A presentation drawing in two shades of red chalk of a bacchanal of children, with a drunken adult man at lower right and a satyress at lower left. On a rocky staging are five distinct figural groups. At the centre a group of children struggle to carry the corpse of a deer towards a cauldron; their companions stoke the fire and stir the pot, while another bears a small boar on his shoulders, and a boar’s head and a hare hang behind. At upper right, children drink from a wine vat – one appears to be clambering in, while another urinates into a wine bowl that will soon be offered to his friend. At lower left an aged satyress suckles a child, while at lower right a man slumps in what may be a drunken stupor. The so-called Children’s Bacchanal is the most highly finished of all Michelangelo’s drawings, and in a pristine state of preservation that allows us to appreciate the deliberate contrast between the stippled modelling of the figures and the more broadly worked setting. The drawing was identified by Giorgio Vasari as among those given to Tommaso de’ Cavalieri, and can be dated to the autumn of 1533, shortly after the Phaethon and before the artist’s final return from Florence to Rome in late October that year. As with the Archers Shooting at a Herm and The Dream, this is not an illustration of a specific literary subject; although the general Neoplatonic meaning seems clear enough, such a dense composition allows the closest reading, and some analyses have seen significance in every detail. The children represent the soul in the absence of reason or intellect, driven solely by natural urges and acting in an animal-like manner (a similar meaning probably attaches to the apes that were to accompany the so-called Slaves in the lowest zone of Michelangelo’s tomb of Julius II). Of the two adults present, one is half-goat and the other is apparently overcome by drink (drunkenness was used by Neoplatonists such as Cristoforo Landino as a metaphor for the unknowing captivity of the soul by the body, and was convincingly portrayed by Michelangelo in his early sculpture of Bacchus; Museo Nazionale del Bargello, Florence). Indeed the four drawings that Michelangelo executed for Cavalieri can be seen in Platonic terms as a coherent group: ‘If the Ganymede symbolises the enraptured ascension of the Mind, and if again the Punishment of Tityus and the Fall of Phaethon exemplify the fate of those who are uncapable of controlling their sensuality and imagination, the Children’s Bacchanal, which is entirely devoid of amorous tension, might thus be the image of a still lower sphere: the sphere of a purely vegetative life which is as much beneath specifically human dignity as the Mind is above specifically human limitations’ (Panofsky, Studies in Iconology, p. 223). The drawing’s sources range from Roman sarcophagus reliefs of playing putti and the Death of Meleager to the works of Donatello and Mantegna. Many of these sources are funerary in nature or related to Bacchic rites – not in the simple sense of revelry, but the pagan rituals of sacrifice and renewal as they were understood in the Renaissance; one of Michelangelo’s poems of the period speaks of attaining new life ‘as a serpent sloughs on a stone, [that] I might through death change my condition’ (‘come serpe al sasso si discoglia, / pur per morte potria cangiar mie stato’. Ryan, The Poems, pp. 90–91). The central group of the deer being carried to the pot is derived from Raphael’s Borghese Entombment (Galleria Borghese, Rome), and a sketch by Michelangelo for the Bacchanal in the Musée Bonnat, Bayonne, bears on the other side of the sheet a closely related composition of a Deposition or Entombment in which a group of figures lower to the ground (or begin to lift) the body of Christ, a mirror image of the stupefied man here. Michelangelo intuited the close relationship between the pagan rituals of death and renewal and the redemption of humanity through Christ’s sacrifice and resurrection, and the chalice and animal’s head in the foreground suggest both Christian and pagan sacrifice. This was the period of Michelangelo’s intensive explorations of the Resurrection, but that triumphant rebirth of Christ had to be preceded by a descent into the lowest zones, and that is, at its heart, what we see here. Text adapted from M. Clayton and K. Perov, Bill Viola | Michelangelo: Life, Death, Rebirth, London 2019, no. 13. Tommaso de' Cavalieri; Emilio de' Cavalieri, from 1587; Cardinal Odoardo Farnese, by 1602; eventually listed in George III's 'Inventory A', c. 1810, p. 45, 'Mich: Angelo Buonaroti' / Tom. II (c. 1802): '3. Several Boys carrying a dead Monster, One with a Pig; some boiling a Caldron, other in Groupe in the foreground drinking; A female Satyr and two Children; one sucking her lank Breast, the other uncovering an Old Man a Sleep - perhaps the Emblem of Night - the subject very obscure, but the Drawing very Capital...Red Chalk. ').